As a natural antibacterial cationic peptide, ε-poly-l-lysine (ε-PL) is applied as a food preservative. However, the mechanism of ε-PL against Staphylococcus aureus (S. aureus) has not been elucidated. Especially, its antimicrobial mechanism at the metabolomics has not been yet thoroughly described. This work aimed at clarifying the antibacterial activity and mechanism of ε-PL against S. aureus. Effects of ε-PL with different concentration on cell morphology, cell wall, and membrane integrity were investigated. Furthermore, the effect of ε-PL on metabolite properties of S. aureus was also studied. The results revealed that ε-PL disrupted the cell wall and membrane integrity of treated cells. ε-PL induced the structural change of peptidoglycan in cell wall, causing cell wall more fragile. Meanwhile, the permeability of the S. aureus cell membrane was increased by ε-PL. More importantly, ε-PL with different concentration could cause different effects on metabolic pathways of S. aureus. ε-PL with high concentration could directly restrain the central carbon metabolism. However, ε-PL with low concentration could only inhibit the glycolytic pathway. These results showed that the antimicrobial mechanism of ε-PL against S. aureus was a synergistic action. The online version of this article ( https://doi.org/10.1186/s40643-019-0246-8) contains supplementary material, which is available to authorized users. ε-Poly-l-lysine (ε-PL) is a cationic peptide that consists of 25–35 residues of l-lysine (Dodd et al. 2018). ε-PL has been reported to display high water soluble and thermal stability (Chen et al. 2018). In general, ε-PL was discovered as an extracellular material produced by filamentous actinomycetes such as Streptomyces albulus and Lysinopolymerus (Shukla et al. 2012). As a natural antimicrobial peptide, ε-PL can inhibit various microorganisms, such as most of bacteria, yeast, and virus (Shukla et al. 2012). Furthermore, ε-PL are biodegradability, edibility, and innocuousness. Therefore, ε-PL has been widely used as a preservative in many foods such as meat, rice, cooked vegetables, and other food (Chheda and Vernekar 2015; Fadli et al. 2012). In the past few years, the antimicrobial activities of ε-PL have been reported (Geornaras et al. 2007; Liu et al. 2017). However, its antibacterial mechanism has not been absolutely elucidated (Wei et al. 2018; Bo et al. 2015; Hyldgaard et al. 2014). Only a few reports showed that ε-PL can cause morphological damages strip the outer membrane, and cause abnormal distribution of the cytoplasm. For example, Lin et al. found that addition of ε-PL could induce the marked change on the morphology of Listeria monocytogenes cells. Furthermore, the destructive effect of ε-PL on cell structure was further demonstrated by the same group (Lin et al. 2018). Similarly, Ye et al. found that E. coli O157:H7 cells exposed to ε-PL showed collapsed, lysis, and rough membranes (Ye et al. 2013). Besides, mycelial growth, spore germination rate, and germ-tube length of Penicillium digitatum were markedly inhibited by ε-PL. Meanwhile, ε-PL caused serious damages on mycelial morphology and plasma membrane (Liu et al. 2017). Our previous studies demonstrated that ε-PL could significantly change the cell wall composition of Saccharomyces cerevisiae (S. cerevisiae), and result in cell wall more fragile, thus increasing the cell wall permeability (Tan et al. 2018). In general, researchers agree that the antimicrobial effect of ε-PL is to destroy cell membranes or cell walls (Zhang et al. 2018; Li et al. 2014; Melo et al. 2009). Up to now, its antimicrobial mechanism at the metabolomics has not been yet thoroughly described. Especially, little information is available about the effect of ε-PL at different concentration on antimicrobial activity and the mechanisms involved. 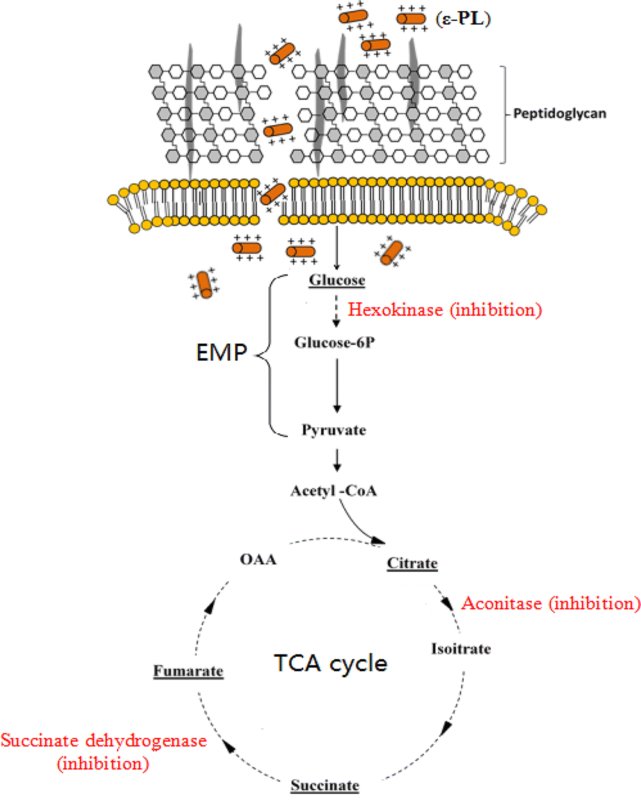 Saccharomyces cerevisiae has also proven to be a good model eukaryote to study the inhibition effects of and the cellular responses to antimicrobial preservatives (Prashar et al. 2003; Belletti et al. 2014; Peng et al. 2016). Recently, we investigated the impact of different concentration ε-PL on S. cerevisiae metabolism through the study of variation of intracellular metabolites. The results showed that the ε-PL could inhibit primary metabolic pathways of S. cerevisiae (Bo et al. 2014). However, to our best knowledge, the effect of ε-PL on the metabolism of prokaryotic microorganisms has not been reported. Staphylococcus aureus (S. aureus) is considered as one of the major food-borne pathogens that causes diverse symptoms of food poisoning. Therefore, S. aureus has a serious threat to food safety due to its high tolerance to salt and the stability of its toxins at high temperature (Miao et al. 2016; Chang et al. 2017). Furthermore, in recent years, S. aureus has also been used as a model strain of Gram-positive bacteria in the research of antibacterial mechanism (Chang et al. 2017; Pu and Tang 2016; Huang et al. 2014). Up to now, there is no report about the effects of ε-PL with different concentration on the cell wall/membrane and metabolism of S. aureus. The aim of this study was to systematically investigate the effects of ε-PL at the different concentration on cell wall/membrane structural changes and metabolic properties of S. aureus, and the mechanism of actions of ε-PL on S. aureus was explored. The S. aureus ACCC01331 cells were incubated at 37 °C on a rotary shaker at 180 rpm until the optical density (OD600) at 600 nm reached 0.2, and then, ε-PL was added to cultures at the final concentrations of 250 µg/mL, 500 µg/mL, and 750 µg/mL, respectively. The cultures without addition of ε-PL were used as control samples. The viability of S. aureus cells treated by ε-PL was obtained by plate count method. The S. aureus cells were observed by SEM by the improved method (Shimada et al. 1993). Briefly, S. aureus cells were collected after incubating with ε-PL by centrifugation (3000×g, 5 min). Then, 0.1 M phosphate buffer saline (PBS) was used to wash the cells twice. 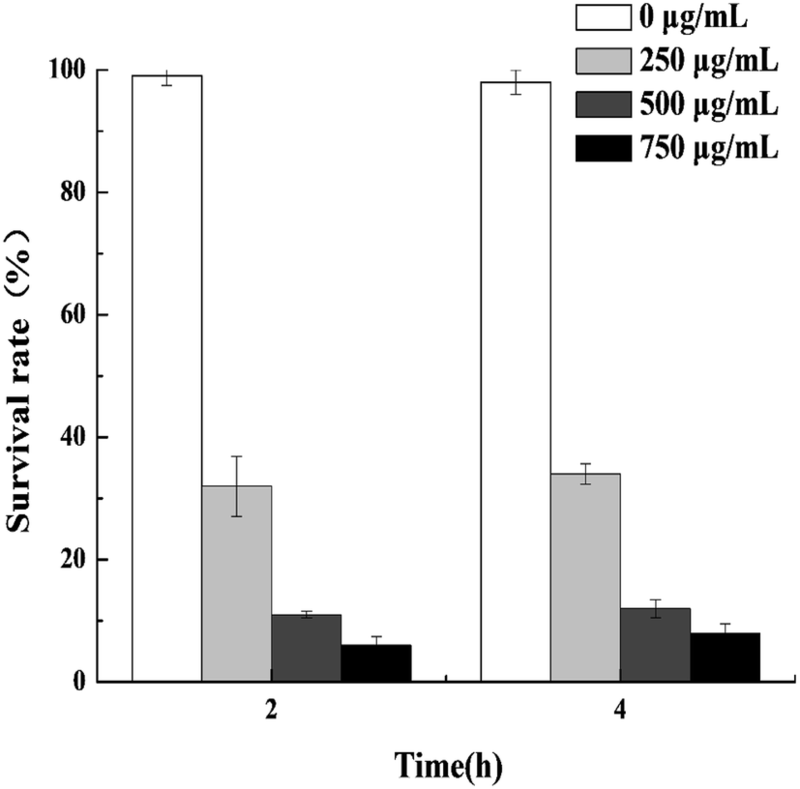 Subsequently, the cells were incubated at 4 °C in 2.5% (v/v) glutaraldehyde for 2 h and dehydrated by immersing them at a stepwise gradient of 30%, 50%, 70%, and 80% to 100% ethanol solution for 15 min. The S. aureus cells were then spray gold treatment (HITACHI E-1010) and subsequently visualized with a HITACHI SU1510 microscopy (Hitachi Instrument, Tokyo, Japan). The method of cell treatment of S. aureus was prepared as described above and the OD600 was adjusted to 2.0. Then, the gold slides with immobilized S. aureus were analyzed using Renishaw 1000 Raman microscope (Renishaw plc., UK). The parameter settings were as follows: the sandwich structure was excitated by 785 nm laser line at 200 mW power for 10 s and the range of spectra was 400–1200 cm−1 (Jarvis and Goodacre 2004). For Fourier infrared spectrum, cells were collected and dried by vacuum freeze-drying. The Fourier infrared spectrum of cells was measured by KBr pellet with 4 cm−1 of resolution and the range of spectra was 4000–400 cm−1. The effect of ε-PL on the cell membrane damaged was ascertained by determining the fluorescence increase of propidium iodide (PI, Sigma Corporation, U.S.) in S. aureus cells in terms of the previous method (Veerman et al. 2010). S. aureus cells by ε-PL treatment were collected by centrifugation (3000×g, 5 min) and washed three times with PBS, and resuspended in PBS. A total of 100 µL of the S. aureus cell suspension was added into 100 µL of PI solution (12 µg/mL) and reacted at 25 °C for 5 min. The fluorescence changes of were detected by a SYNERGYTM4 microplate reader (Biotek, USA) at 535 nm and 617 nm. The result was represented as the mean of three experiments. The S. aureus cells were quenched and extracted in accordance with a method of Liebeke et al. (2012). The chemical derivatization was divided into two phases according to the method of Ding et al. (2010), including methoximation of metabolite samples and subsequent trimethylsilylation. GC–MS analysis was carried out by an Agilent 6890 (Agilent Technologies, Palo Alto, CA) gas chromatograph with an HP-5 gas chromatography capillary column (60 m × 320 µm i.d., 0.25 µm film thickness) according to the protocol described by Bo et al. (2014). The mass spectrometric data were processed by MSD Productivity ChemStation software (Version E.02 01.1177 Agilent Technologies) and compared with the standard library (NIST, the National Institute of Standards and Technology mass spectral library 2008). Principal component analysis (PCA) and partial least-squares (PLS) analysis were performed with the data which was previously pre-treated by SIMCA package for the multivariate statistical analysis. The unsupervised PCA model was carried out to gain the diversity between the samples which treated with different groups of ε-PL. In addition, another unsupervised hierarchical cluster analysis (HCA) was used to obtain another unsupervised analysis by the HCE 3.5 software. The supervised PLS was introduced to identify the metabolites that closely connected with ε-PL stress. Staphylococcus aureus cells were harvested by centrifugation at 3000×g for 5 min and washed three times with 0.1 M PBS, and then disrupted in a homogenizer with glass beads after resuspending in ultrapure water. The cell lysates were harvested by centrifugation (10,000×g, 5 min) at 4 °C. After centrifugation, the supernatants were stored at − 20 °C to enzymatic activities assay. Succinate dehydrogenase, aconitase, and hexokinase activity were determined by assay kits (Nanjing Jiancheng Bioengineering Institute, China). Protein concentrations were measured in terms of a modified method of Lowry (Dulley and Grieve 1975). 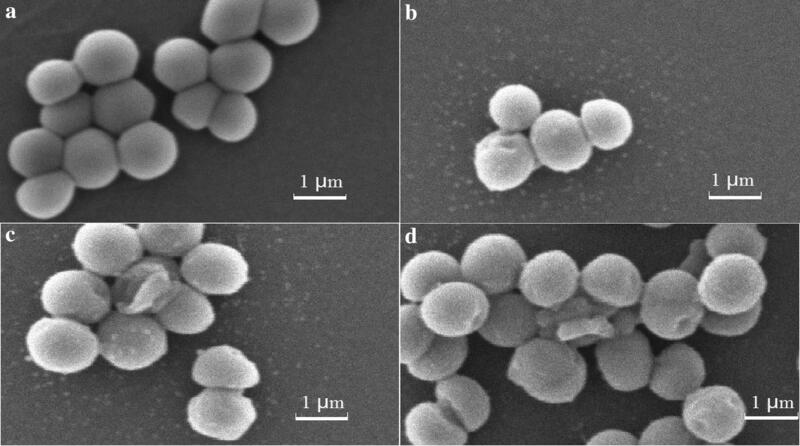 The method of cell disruption of S. aureus was prepared as described previously. Intracellular ATP levels were evaluated with BacTiter-Glo™ kit from Promega. The result was represented as the mean of three experiments and fluorescence was measured by fluorometry (LumiCount TR, Packard Instrument). First, the minimal inhibitory concentrations (MIC) of ε-PL against S. aureus were determined to be 50 µg/mL. The results were in accord with the previous reports (Zahi et al. 2017). However, some reports also indicated that the MIC value of ε-PL against S. aureus was below 20 mg/mL (Li et al. 2014; Zhou et al. 2011). The reason might be the differences in purity of ε-PL and strains. Then, effects of different ε-PL concentration on the cell survival rate of S. aureus were investigated. The results are shown in Fig. 1. The cell survival rate of S. aureus was decreased dramatically in contrast to the untreated cells. Furthermore, the cell survival rate decreased with increasing the concentration of ε-PL (Fig. 1a). For example, the cell survival rate of S. aureus decreased to 30.1% at low concentration ε-PL (250 µg/mL) for treatment 2 h. However, the cell survival rate dramatically decreased to 10.7% and 4.7% when the concentration of ε-PL was increased to 500 µg/mL and 750 µg/mL, respectively. Similar phenomenon was found when the treatment time was increased to 4 h. The results indicated that antimicrobial activity of ε-PL against S. aureus had primarily dependence on concentrations of ε-PL. To further characterize the bactericidal effects of ε-PL, SEM was used to visualize the morphological changes of S. aureus cells exposed to ε-PL. As shown in Fig. 2, the surface of the untreated S. aureus cells was bright and smooth. However, compared with untreated cell (Fig. 2a), some of the treated cells by 250 μg/mL ε-PL exhibited collapse (Fig. 2b). Furthermore, with the increase of ε-PL concentration (500 μg/mL), more collapsed cells were observed (Fig. 2c). When the concentration of ε-PL reached 750 μg/mL, the S. aureus cells appeared indentations, collapsed, lysis, and non-integral cell morphology (Fig. 2d). These results showed that ε-PL caused obvious destruction on cell wall/membrane of S. aureus, indicating that the substances of cell walls/membranes of S. aureus occurred obvious changes. The previous reports showed that ε-PL can interact directly with microbial cell walls/membranes to increase the membrane permeability and cause rapid cell death (Ye et al. 2013; Tan et al. 2018; Miao et al. 2016). It is generally known that peptidoglycan is the main component of cell wall of S. aureus. To confirm whether cell wall component of S. aureus was affected by ε-PL, Raman spectroscopy and Fourier infrared spectrum were performed. The results are shown in Fig. 3. 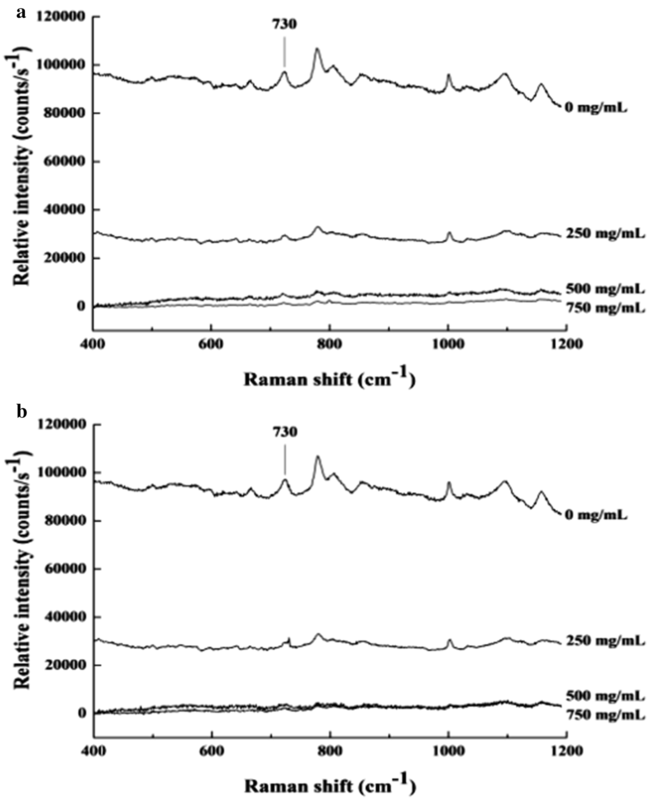 The peak at 730 cm−1 of Raman shift was corresponded to peptidoglycan structure (Belletti et al. 2014). The intensity of peak at 730 cm−1 gradually decreased with the increase of the concentration of ε-PL after 2 h/4 h treatment (Fig. 3a, b), indicating that peptidoglycan structure was destroyed by ε-PL. These results suggested that peptidoglycan in cell wall of S. aureus could be dramatically damaged by high concentration ε-PL, thus causing cell wall more fragile. Our previous reports showed that ε-PL could change significantly content of S. cerevisiae cell wall, thus increasing the cell wall permeability (Tan et al. 2018). To further confirm whether the permeability of the treated cell membranes was enhanced, cell membrane permeability was measured by the propidium iodide (PI) assay. The results are showed in Additional file 1: Fig. S1. In contrast to the untreated cells, the ε-PL-treated cells exhibited remarkable increase in fluorescence intensity. Furthermore, with increase of ε-PL concentration, the fluorescence intensity enhanced. Similar results were also observed by Bo et al. (2014). Obviously, ε-PL could pass through the cell wall and disrupt the cytoplasmic membrane. These results indicated that the cell membrane permeability was increased by the interaction between ε-PL and cell membrane. 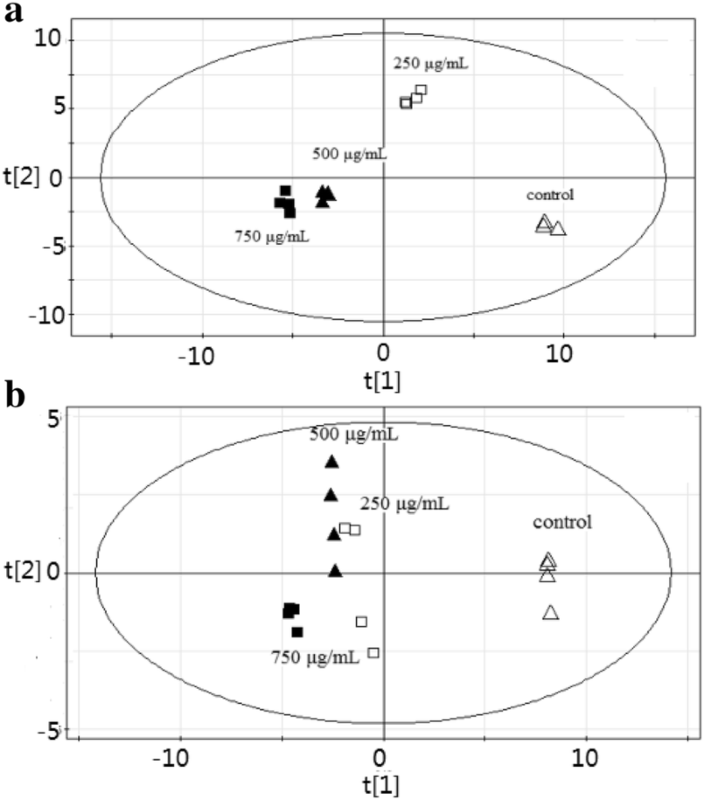 The previous reports showed that GC–MS-based metabolomics approach was a useful method for identifying microbial intracellular substances after treatment with antimicrobial agents (Bo et al. 2014; Xu et al. 2017). Therefore, to confirm whether ε-PL could induce changes of intracellular metabolite of S. aureus, 54 metabolites were detected and identified from 100 putative intracellular metabolites by a GC–MS-based metabolomics approach (Table 1). These metabolites included a variety of amino acids (e.g., valine, serine, isoleucine, threonine, and leucine), sugars (e.g., ribose, arabinose, and mannose), alcohols (e.g., mannitol), and organic acids (e.g., citrate). In contrast to the untreated cells, metabolites have significantly changed in ε-PL-treated cells, including carbohydrates, alcohols, lipids, and amino acids. For example, the intracellular concentration of glucose in the treated cells was increased about 1.5- and 2.5-fold, respectively. 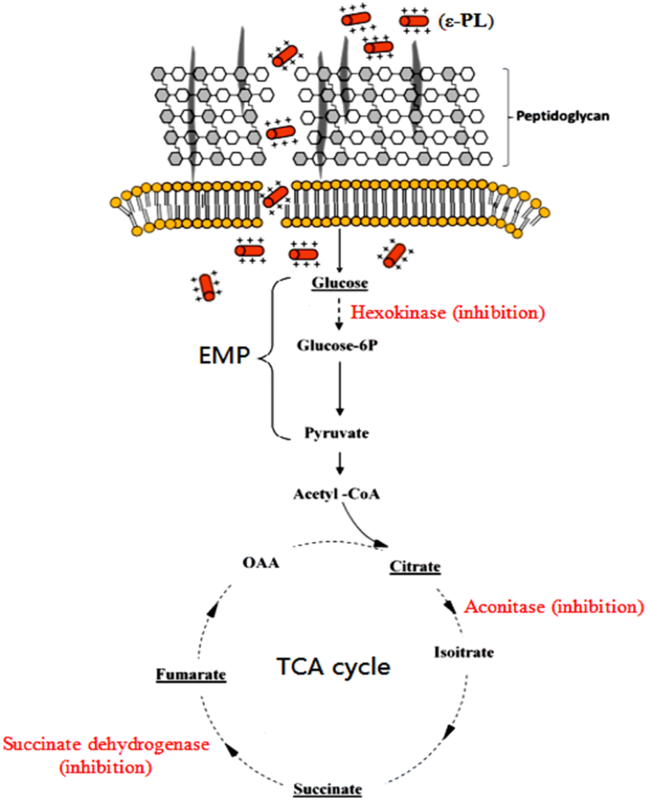 The results showed that ε-PL promoted the intracellular accumulation of glucose, indicating inhibitory effect of ε-PL on glycolysis (Table 1). As a result, the relevant survival rate of ε-PL-treated cells decreased to 4.7% and 6.9% compared to the untreated cells, respectively. Meanwhile, our results showed that the intracellular pools of amino acids could be affected by ε-PL. When cells were treated by low concentration of ε-PL (250 µg/mL), the contents of some intracellular amino acids increased, such as alanine, valine, leucine, proline, and isoleucine. It could be due to a self-protection mechanism for microorganism against environmental stresses. With the increase of ε-PL concentration (750 µg/mL), the contents of alanine, valine, and leucine in the treated cells decreased, indicating the limit of self-protection for S. aureus under higher concentration of ε-PL (Table 1). Furthermore, glyceraldehyde-3-phosphate (glycerate-3-P) and 3-phosphoglyceric acid (glycerate-2-P) also significantly decreased after treated by ε-PL. These results demonstrated that the levels of metabolic intermediates of the Embden–Meyerhof–Parnas (EMP) pathway decreased under ε-PL treatment, indicating that EMP pathway was inhibited by ε-PL. Furthermore, the contents of citrate in the TCA cycle were increased by ε-PL, whereas succinate and fumarate decreased after ε-PL treatment. This decrease was probably driven by the accumulation of citrate, which may be due to the loss in activity of enzymes involved in further metabolizing the citrate. In addition, PCA showed that there were significant differences between ε-PL-treated cells and the control. Distinct clustering could be observed among different groups, such as different treatment time and different ε-PL concentration (Fig. 4a, b). At the same time, HCA and PLS analysis also showed a similar clustering pattern with the result of the PCA (Additional file 1: Figs. S2, S3). These results suggested that the ε-PL could cause comprehensive effects on cell metabolism. In addition, the activity of succinate dehydrogenase, aconitase, and hexokinase in TCA cycle and glycolysis was assessed at 2 h and 4 h after treatment with ε-PL. In contrast to the untreated cells, three enzyme activities decreased in the ε-PL-treated cells (Additional file 1: Fig. S4), and the activities of three enzymes decreased with the increase of the concentration of ε-PL. In addition, there was an immediate and irreversible drop in the internal level of ATP after 2 h of ε-PL treatment, and the ATP level decreased to 92%, 84%, and 56% of its original value with treatment of 250 µg/mL, 500 µg/mL, and 750 µg/mL ε-PL, respectively (Additional file 1: Fig. S5). Similar phenomenon was observed in ε-PL treatment cells for 4 h (Additional file 1: Fig S5). These results further demonstrated that ε-PL could cause metabolic blocks in both TCA cycle and glycolysis. According to the above results, the possible mechanism of ε-PL on S. aureus is proposed in Fig. 5. First, cationic ε-PL attaches to negative-charged teichoic acid embedded in the peptidoglycan layers of S. aureus cell wall. The peptidoglycan structure in cell wall is destroyed by ε-PL, leading to cell wall fragility. Next, the cell membrane is disturbed by ε-PL, and this disturbance further induces the changes in hydrophobic region and bilayer curvature of cell membrane, causing increase of cell membrane permeability. Finally, ε-PL enters into the cells and interrupts the primary metabolism of S. aureus, thus killing the cells. The previous reports showed that mycelial growth, spore germination rate, and germ-tube length of eukaryotic microorganisms (Penicillium digitatum) were markedly inhibited by ε-PL (Liu et al. 2017). Furthermore, ε-PL also damaged the cell wall and cell membrane of eukaryotic microorganisms (Trichothecium roseum) (Wei et al. 2018). Therefore, these results suggested that inhibition of mycelia and spore growth, and damage of the cell wall and membrane by ε-PL were closely related to the eukaryotic microorganisms’ death. Unlike eukaryotic microorganisms, in this study, we found that ε-PL first destroyed cell walls and membranes of prokaryotic microorganisms (S. aureus), increasing cell permeability. Subsequently, ε-PL entered cells and inhibited cell primary metabolism, killing prokaryotic cells. In summary, we demonstrated that ε-PL induced the structural change of peptidoglycan in S. aureus cell wall, causing cell wall more fragile. Meanwhile, ε-PL could disturb S. aureus cell membrane, improving cell membrane permeability. Especially, the ε-PL stress could lead to the inhibition of primary metabolic pathways through the suppression of the tricarboxylic acid cycle and glycolysis. The synthetic effect of these factors affected the cells, and caused the death of the S. aureus cells. ZLT and SRJ developed and designed this study. YFS and BX performed the experiments. JDC drafted the manuscript. YH assisted in the research experiments. All authors read and approved the final manuscript. 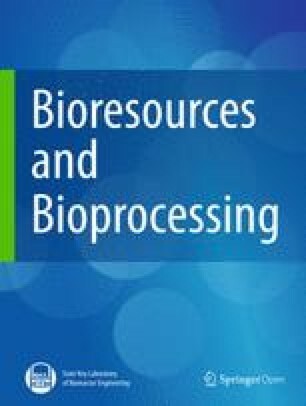 All authors have read this article and have approved its submission to bioresources and bioprocessing. This study was partly financially supported by the National Key R&D Program of China (Project 2018YFD0400205), the Foundation of Tianjin Engineering Research Center of Microbial Metabolism and Fermentation Process Control (17PTGCCX00190), and National Natural Science Foundation of China (Project 31771952, 21276197). Additional file 1. Additional figures.